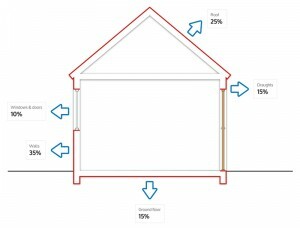 It has been calculated that around 35% of all heat losses in homes with poor or no insulation is wasted through the walls. As in first law of thermodynamics, heat flows from a hotter body to a colder one until thermal equilibrium is reached. So in winter, heat flows from inside (hotter) to the outside, colder, environment. In summer hot days the reverse applies. If your house has poor insulation then it is to your best interest to take immediate action in improving your home insulation and stop wasting energy and good money off your energy bill. Simply put, poor insulation costs you money; you are actually paying for heat energy, electricity, diesel, or gas – depending on your heat source, to heat not only your home but also the surrounding environment. Consequently you are wasting money heating the exterior cold air instead of just the internal of your home. Depending on the scale of your heat losses, by insulating properly your house walls you could be saving energy and good money on your energy bill. Here are some energy saving tips for wall insulation that will increase the energy efficiency of your home. Depending on the type of your house walls, there are different ways of applying an insulation solution – or improving existing wall insulation. A cavity wall is one that has a cavity – gap – between two separate thin walls usually made of brick or concrete. 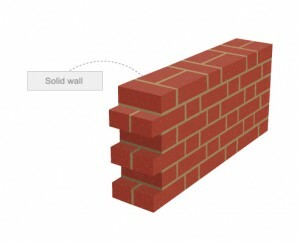 Consequently a cavity wall is made up of the internal wall layer, the middle gap and the external wall layer. Cavity walls were most common in homes after 1920 whereas, houses before that were usually built with single – solid – walls. A solid wall has no cavity in the middle; it is made up of a single wall layer and it is generally made of stone or brick. In case you have no access to a section of your wall then you are probably not able to determine your wall type – directly. However, by measuring your wall thickness, next to a door or a window section, then you can have a close guess; cavity walls are usually thicker than single walls, with the former type at around 25-28cm and the latter around 20cm. 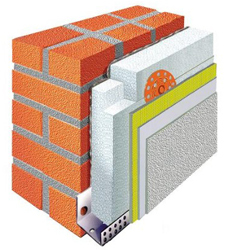 Apart from Cavity and solid walls other wall types will have different thermal and construction – static – properties and may require a different approach for wall insulation. Other wall types include amongst other steel-frame or wood-frame (timber) houses or buildings with pre-fabricated concrete walls. In general such wall types have no cavity and may be close to the single solid type wall – thus, under appropriate circumstances, they may be insulated under the same principles that apply for solid walls. Cavity wall insulation usually involves applying insulation in the middle of the wall by filling the cavity – air gap – with insulating material such as – polyurethane, mineral wool or insulating beads – Refer to article on cavity wall insulation. Solid wall insulation can be applied to the exterior surface of the wall – external insulation – or to the internal wall surface facing the house interior. Both methods have their advantages and disadvantages; the most appropriate solution for your home may depend on your house custom-specific circumstances – house walls and your local environmental conditions – refer to next article on solid wall insulation.